The completion and method of turnover of a project are not always fixed, but are determined for each project by contract. The turnover of plant in construction/engineering projects is carried out in the way that the completion of the responsible scope of the contractor as specified in the contract is confirmed by both the contractor and the customer. By transferring the management responsibility of plant to the customer, it is called turnover by the side that delivers, and takeover by the side that receives the delivery. Usually, excepting the case of a full turnkey contract, it is carried out some time after the mechanical completion of the plant up to the completion of the commissioning. Meanwhile, when being seen from the customer's standpoint, if the customer concludes a financing agreement with a financial institution based on a project finance, even when the physical turnover with the contractor has been realized, the completion of the plant may be deemed to have not been made in terms of the financing agreement. This is likely to occur when the financial institution requires, based on the pledging clause of the financing agreement, that the customer should satisfy the preconditions that the project should produce cash flow securely and steadily, in parallel with the physical completion of plant. Such a way of thinking is called financial completion, in contrast with the physical completion. When being seen from the customer's viewpoint, unless the pledging clause of the financial institution has been met and the completion of the plant has been verified with it, the fulfilment of obligations to the financial institution concerning the completion of plant will not be released. The turnover of the project for a software development project varies depending on the type of project, scope of work, sharing of roles, etc. with the customer, and is determined for each project based on the contents of the confirmation sheet as agreed upon between the two parties: the customer side and the supplier side. The turnover in software development is made after the completion of the responsible scope as agreed upon by the confirmation sheet has been confirmed by both of the customer side and the supplier side. 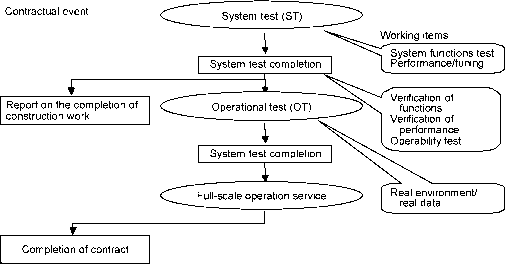 The important point in the responsible scope in the stage of establishment in software development is that, the transfer of the system built in software development to the operational test phase using an actual operational environment and real data becomes the point of turnover, and the management responsibilities and the main body of work thereafter are transferred to the customer side. The procedure from the built up stage of software development up to the completion of the project can be seen as follows. The contract of software development is carried out in 3 stages basically. 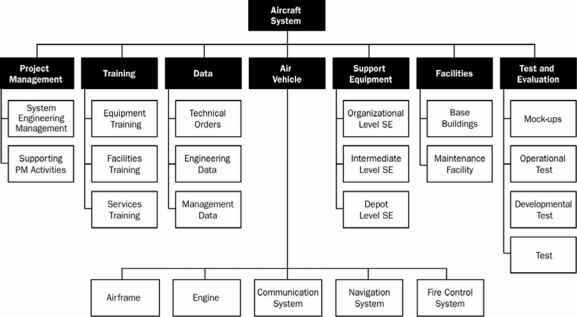 Those 3 stages are, requirement definition design stage, built up stage and operational preparation transfer stage. While the turnover as the delivery of products is carried out in each stage, the deliverables of the project, namely the turnover of the whole system is usually carried out upon completion of the built up stage (system test completion). The completion as a project is made upon full-scale operation (service-in) after the operational test phase has been finished. A contract is often concluded by combining the 3 stages into one, or by combining more than one of them.